With great anticipation, I finally have some new material from Grave Digger. After the superb Rheingold album, I couldn't help but wonder if Grave Digger would be able to keep up the streak of excellent albums with this new one, a concept album entitled The Last Supper. Grave Digger has really been on a roll since the Excalibur album. They have steadily churned out albums of metal excellence without looking back. The Last Supper is a good Grave Digger album, but I do feel that it falls short of the great albums we've heard from this band in recent years. After the obligatory intro, things get started with the title track. Oddly enough, this is a slow and plodding track that turns out to be ominous of things to come. The song features a catchy chorus line, along with a haunting piano intro and outro. However, the song is lacking the punch or energy that you would expect from the band, especially as the opening track. Things get better with the next track, Desert Rose. Here, we are treated to a classic Grave Digger song: powerful, melodic, and given an extra hard edge thanks to Chris Boltondahl's unmistakable harsh and raspy vocals. Let me jump off on a tangent for a moment and say that Chris' vocals have steadily improved over the last 4 or 5 albums. Earlier (even in the early to mid 90's), he was rather unrestrained in his delivery, alienating many fans from his music. My first Grave Digger album was Tunes of War, and honestly, the vocals turned me off at first. I got back into the band with Excalibur after reading very positive reviews, and have followed them ever since. Compared to his earlier works, I think Boltondahl has really learned how to effectively use his voice, and I quite enjoy his singing nowadays! Having said that, I would urge any fan that dismissed this band years ago because of the vocals to check out their newer material; you may very well get into it! Now, back to the album. Grave In No Man's Land is next in line. We see the band alternate back to a mid tempo pace, but it works well here. The song is addictive, with a faint hard rock element showing up in terms of the riffing and drum patterns. The evil sounding chorus line just won't leave my head. Now I'm starting to see a pattern: classic, powerful cuts and mid tempo tracks alternate during the course of the album. Sure enough, Hell to Pay follows this pattern, following up Grave In No Man's Land in fine fashion. A very deliberate "Hell….To….Pay" chorus gives this song an anthem like quality, but something is missing. In fact, this same "something" has really been different since the album started; the riffing. The riffs just fit into the music as another ingredient to the music. They aren't played with the urgency and intensity of say a track like The Grave Digger or Pendragon. I used to find that Grave Digger riffs really stood up to make me take notice, but on this album they just fit into the songs without really drawing a lot of attention. I'm not saying that the riffing is bad per se, but they're probably not going to knock your socks off either. I'd compare this to using the finest, top shelf vodka to make a drink, but then shifting to a mid priced (but not cheap) vodka instead later on. Soul Savior follows suit, with another surfacing of some hard rock elements. This time, it's more of a rock 'n roll meets power metal sort of offering. Much to my pleasure, the band again pulls this off very well. The charismatic delivery of Boltondahl couple with a fiery extended solo win me over here. This song is much like Giants from the Rheingold album. Up next is the first real dud for me on this album, Crucified. This is a slow, 7 minute tune that just falls flat for me. Granted, Boltondahl gets a chance to show another side to his vocal delivery here, the song is just boring. It just keeps and going and going, for seven minutes, without any type of climax or direction. The album gets back on track with Divided Cross. Strangely, a Maiden like guitar rhythm opens the song, which develops into a mid to fast paced, chains and leather type of metal anthem. In the middle of the song, the tempo slows down a bit, allowing for a hard rockish, but very good guitar solo. The Night Before continues the string of mid tempo songs that occupy the second half of this album. This isn't a bad track, but it does sound a little bit redundant at this point. I wouldn't consider this song filler, but I am starting to get that "heard it before" feeling come over me. Black Windows finally picks up the pace with some classic Grave Digger power. Again, this is a good track, but nothing stand out. For the tenth spot of the album, it's a serviceable track, no more than that. We have an average sounding chorus line and equally average guitar work. The powerful tracks on the first half of the album are much more memorable. Hundred Days raises my level of interest just in time. A subtle keyboard texture is buried behind the varied double bass drum beat, which helps to emphasize the melodic refrain. This track also features some of the more inspired riffing and shreds on the album. Finally, the "in your face" side of Grave Digger has reared its head! The album concludes on a soft note, the balladesque Always and Eternally. There are some piano passages present that give this song an emotional touch, and Boltondahl delivers a nice performance behind the mic. Aside from that quite honestly, the song is a rather uneventful and quiet way to end the album. To summarize my thoughts, I was initially let down by this album a lot more than my score indicates. Additional listens found me getting into the individual songs more, despite their lack of bite (especially in respect to the guitar work). 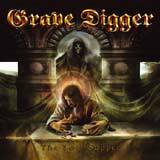 Although I do prefer the more powerful side of Grave Digger, they have shown the ability to construct quality mid tempo songs as well, even with the inclusion of some hard rock sounds. On the negative side, I can tell you that after many, many listens, the second half of the album becomes more than just a little tedious, starting with Crucified. Hundred Days is a nice payoff if you are patient enough to stick with it through the end, though. Even though I am a huge Grave Digger fan, I need to carefully consider the previous statement when coming up with a quote. The weak points on the second half of the album are enough to prevent me from declaring this a "very good" album. There are absolutely plenty of very good moments to be found, but dull and redundant moments that plague the second half can't be ignored. When compared to the impressive history of this band, I think "fair to good" is an accurate description of this album. Fans of Grave Digger will find a lot to like here, just as long as you don't expect the album to be the band's pinnacle moment.